Tom Smith went 3 miles a day on a hand-cycle. MIAMI — Tom Smith used to skate “like his hair was on fire,” according to his former hockey coach. He played for Team Massachusetts, and NHL scouts noticed his speed. But then, with lightning quickness, his life changed. In a bizarre twist of fate, he was twice paralyzed in separate hockey accidents in 2008 and 2009. Earlier this month, Smith, 25, completed a 2,100-mile journey from Boston to The Miami Project to Cure Paralysis, the place where doctors saved his life. The “Reality Ride Challenge” raised nearly $100,000 for paralysis research and was a testament to one man’s perseverance. The Swampscott, Mass., native started at the Bobby Orr statue at TD Garden on March 25 with a group of cyclists. Each day, he pedaled 65 miles, used a hand-cycled wheelchair for 3 miles, and walked a mile with two canes for support. Smith, who is technically still a quadriplegic, lacks sensation in his hips, upper chest, and right foot. But he didn’t let that stop his journey. His uncle, whom he jokingly calls “MacGyver,” jury-rigged a 10-speed bicycle with a mirror in the center that would serve as a gyroscope to keep him from wobbling. Smith taped his canes along the bike frame and headed south on Route 1. He pedaled through snow in Connecticut, and survived a yellow pollen explosion that clogged his contact lenses in North Carolina. In rural South Carolina, he had chest pain, and felt numbness and tingling in his left arm — classic symptoms of a heart attack. The pain persisted even when he tried to sleep in the RV support van driven by Adam Marquez, who is also a documentary filmmaker. “The only way you were going to stop him was with a gun,” says Marquez. But Teague Egan, Smith’s best friend, riding partner, and co-founder of the Reality Ride, wanted to throw in the towel. “Initially I said, ‘I’m not riding with you,’ ” says Egan. “Adam said he’s not driving the RV. No one wanted to call his mom and tell her you had a heart attack and died on the side of the road. 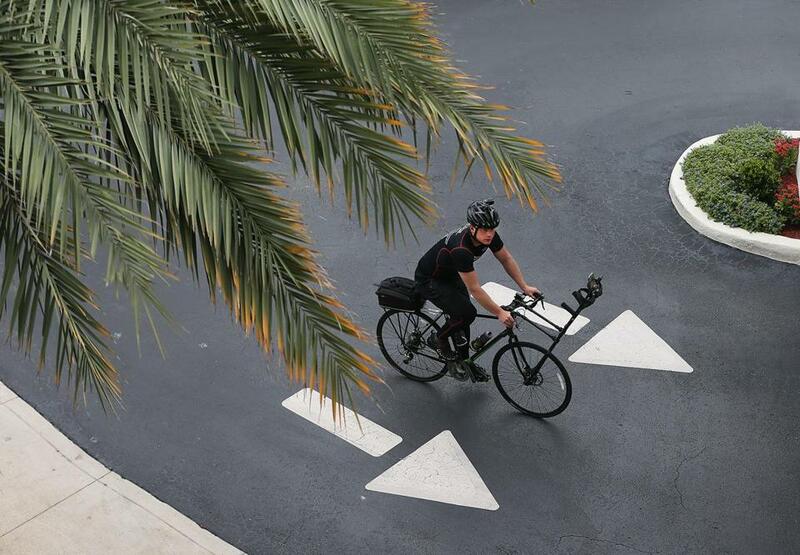 Tom Smith biked during his “Reality Ride Challenge” from Boston to Miami. But Smith refused to quit. He thought of his mother, who had been devastated by his injury. “There was no greater pain than hearing my mother cry at night,” says Smith. “Crying that she couldn’t help. He thought of Chris Boshar, a Smith Foundation grant recipient who was paralyzed from the neck down in a diving accident in a New Hampshire lake. He thought of the support and love from Travis Roy, whose college hockey career at Boston University lasted just 11 seconds before he was paralyzed in an on-ice accident, and Matt Brown, the Norwood High hockey player who was paralyzed when he crashed head-first into the boards. So Smith went to an emergency room in Charleston, S.C., where he was diagnosed with an inflammation of the heart. He was given anti-inflammatory drugs, testosterone steroids, and antibiotics, and told to rest. Smith’s mother knew her son would continue. Smith agreed to take a day to rest, then start back at 10 miles a day before ramping up. Egan, after consulting other doctors, agreed to continue. But Smith was back in the emergency room in Jacksonville, Fla., just days later with bronchitis and two ear infections. Still, despite a nasty cough, he seemed to gain an inner strength as the finish line neared and palm trees lined the beaches. Smith wasn’t always a Superman. There was a dark time after his second injury when he simply wanted to die. He hated being dependent on his family. He felt people were staring at him, and some friends had deserted him. He told doctors to leave him alone. “I said basically, ‘You don’t know what I’m going through,’ ” he says. But something changed his life again. “I looked out in the hallway and there was a little boy going by in a wheelchair, controlling it by his tongue, and I was taken aback by it,” says Smith. Doctors said one injury had nothing to do with the other. The first was a “hangman’s injury,” affecting the upper vertebrae; the second was lower, in the thoracic area. “Doctors told me I had a better chance of winning the lottery five times in a row than having two separate accidents totally unrelated,” says Smith. The first time Smith was injured was on Aug. 2, 2008. He was trying to catch an opposing player on a breakaway late in the third period, and he knew scouts were in the house. He caught up to his opponent just as the goalie came out to poke the puck away. “I tried to avoid the collision and jump over the two of them, and my skates hit their helmet and I went head-first into the boards and I was out cold,” he says. When he awoke in the hospital his mother was there. They went to the Miami Project to Cure Paralysis, the world’s most comprehensive spinal cord injury research center, based at the University of Miami Miller School of Medicine. By May 2009, after intensive rehab, Smith was cleared to play again. “I was a walking miracle,” he says. At Boston Bulldogs training camp that summer, Smith was in the best shape of his life. His regimen started with skating with a parachute net at the rink at 6:30 a.m. But then, six games into the season, the unthinkable happened. While skating laps on Oct. 1, Smith was going around the net and got tripped up; he smashed head-first into the boards again. He knew he was in big trouble. “As soon as I hit the boards, I knew I was paralyzed,” he says. “I went numb. When you hit, your body drops like a ton of bricks and you’re Jell-O. But after the little 8-year-old boy changed his life, his new mantra was positive. This time, it took him 27 months to get out of the wheelchair. There were setbacks. His father and he suffered injuries when they were rear-ended in a car accident in January 2010. That set him back to square one in rehab and sent his father to the hospital for three back surgeries. Tom Smith no longer needs a wheelchair and gets around with two canes. Smith has already garnered international attention for inventing the Lookup Line, ice hockey’s first warning track designed to prevent head and spinal cord injuries. He also was honored for his latest efforts, receiving recognition from the Bruins and Celtics, and making pit stops with the New York Islanders, Washington Capitals, and Miami Marlins. The Miami Project already has started the first FDA-approved human clinical trials using Schwann cells, and the results have been promising. Smith believes they are close to a cure and that paralysis research could help in the fight against other diseases like cancer and diabetes. On his 38th day on the road, Smith pedaled into Miami with a gunslinger’s swagger, accompanied by his brother Chris and a small posse of friends. Doctors, nurses, family, sponsors, and friends came out to greet him. He walked the last 50 yards with Marc Buoniconti, president of the Miami Project, who remains paralyzed after sustaining a spinal cord injury in a college football game in 1985. Smith had an emotional meeting with his mother at the finish. “I was thinking about talking him out of it,” says Buoniconti, whose father, Pro Football Hall of Famer Nick Buoniconti, co-founded the Miami Project 30 years ago. “But when you put your mind to something, especially when it seems impossible, it can become possible. His bike mates doused him with champagne, which washed away the tears and the sweat and left Smith beaming with joy. After a night’s rest, Smith watched the Floyd Mayweather-Manny Pacquiao fight at the Buoniconti home. One thing was certain: The true champions were in that living room, not in the ring. Stan Grossfeld can be reached at grossfeld@globe.com. To learn more about the Thomas E. Smith Foundation, go to justcureparalysis.org.